Planning a trip to Turkey? Interested in history and ancient architecture? Are you looking for an interesting day excursion combined with a history and culture experience? Get an insight into the history of Turkey and walk through an open archaeological site of temples, ancient streets, enormous buildings, and amphitheaters? Ephesus is an ancient city rich in Greek and Roman history, close to Kusadasi in Western Turkey. It's also the site of one of the 7 ancient wonders of the world. An ideal day trip from the commercialism of Turkey's resort locations. Ephesus is an ancient Greek city that was founded on the coast of the Aegean Sea during the 10th century BC. It was founded by Attic and Ionian colonists on the former site of the Arzawan capital. The Romans gained control of Ephesus in 129 BC, at which time the city began to flourish. Estimates place the population of the city at around 50,000 souls during its peak under Roman rule. Under the Romans, many prominent features were constructed which we can still visit today. The most famous Roman contribution was the Temple of Artemis, of which relatively little remains to this day. There are some ruins, however, that visitors can see that remain even after the temple was destroyed by the Goths. The Ephesos amphitheatre (see header image of this page) is another impressive site which still remains mostly intact. This open-air theatre could hold 25,000 spectators, and was used for drama and gladiatorial combat. As a result of the gladiators, a graveyard nearby that was discovered in 2007 contains the remains of many who perished in the battles held there. 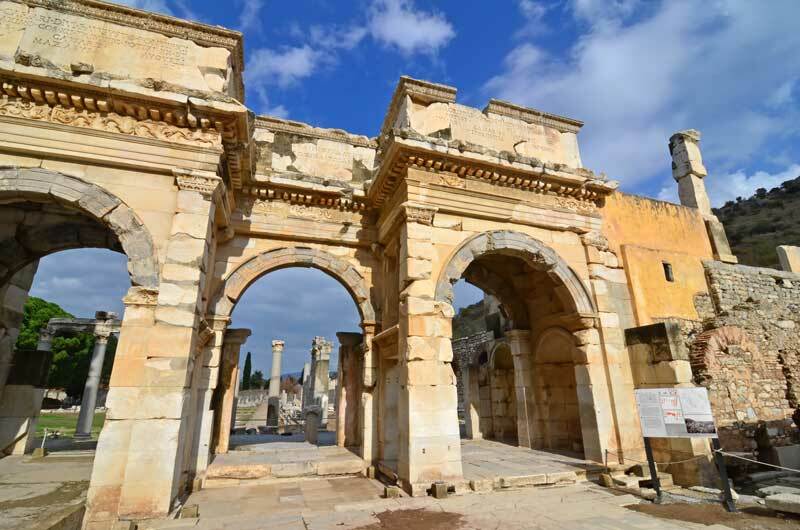 The Romans also built the Temple of Hadrian, The Library of Celsus, many bath complexes, sawmills and aqueduct systems. Ruins of all of these ancient structures are still in place for you to enjoy. From 1304 to 1425, Ephesus was part of the Ottoman Empire. Although the city was dying out with the loss of its seaport due to sediment, another worthwhile feature was built during this time. The Isa Bey Mosque was built from 1374 to 1375 and remains standing to this day. 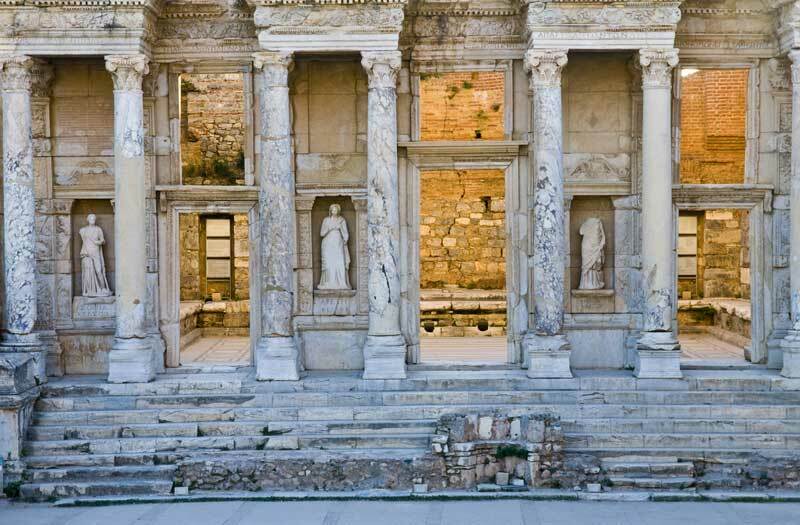 This is another fantastic building in Ephesus you won’t want to miss. Christianity played a large role in the history of Ephesus, and there are several significant sites remaining that people of all faiths will enjoy seeing firsthand. The apostle Paul was said to live in Ephesus for two years, where he was active in the community of Jewish Christians, and was said to have written 1 Corinthians while imprisoned in the tower near the harbor there. John, one of the chief apostles, was also said to have written the Gospel of John in Ephesus from the years 90 to 100 AD. It is also widely believed that the Virgin Mary spent the last years of her life in Ephesus. The House of the Virgin Mary still stands here, and is a popular pilgrimage destination for Catholics, and has even been visited by three popes. The Church of Mary is another important site in Ephesus, with some pillars remaining standing to this day. Other important sites in the Ephesus area are The Gate of Augustus, the Basilica of St. John and the Tomb of John the Apostle, The Odeon, The Temple of the Sebastoi, and the Tomb/Fountain of Pollio. This is by no means a complete list of all the sites in Ephesus, but only the main ones. 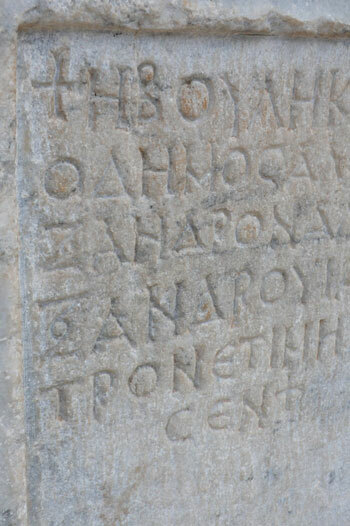 There is a complete list of the sites in and around Ephesus at the end of this article. 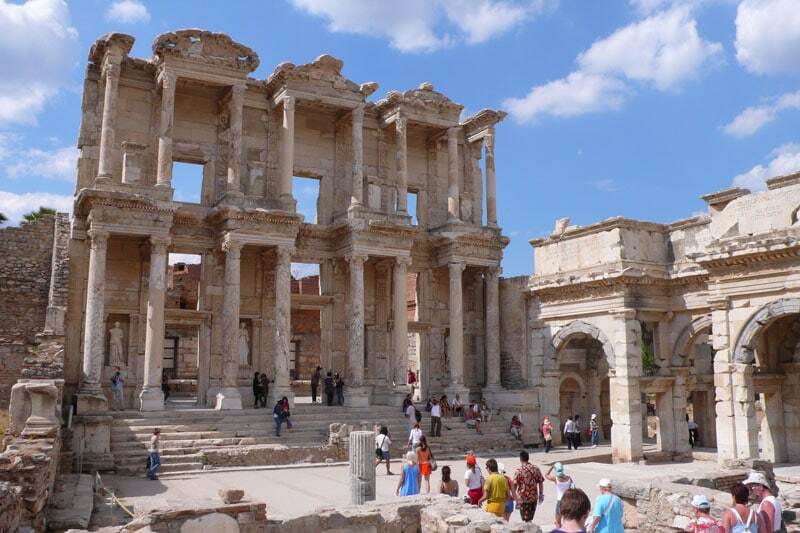 There are several tours available that can help you to see the best of Ephesus in the most efficient way possible if you so choose. 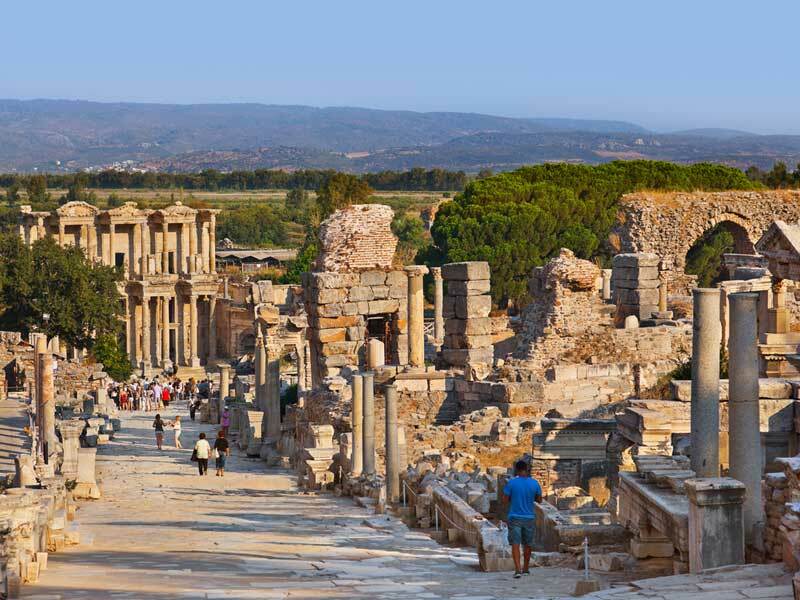 One mile from the site of Ephesus is the modern city of Selcuk, Turkey. The population is around 35,000 people and the economy caters to tourism, so finding a good hotel or quality restaurant is always very easy. Selcuk has an awesome historical feature that you’ll want to see as well. 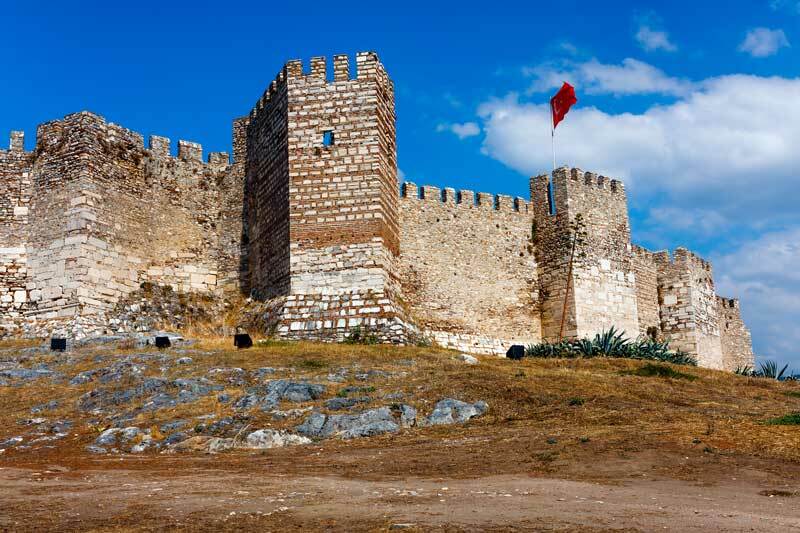 It’s called the Grand Fortress of Selcuk. This massive fortress sits atop a hill north of St. John’s Church, with massive rock walls built during the Byzantine and Ottoman periods. It’s a beautiful sight to behold, and it’s impressive to see that the outer walls are almost completely intact. No trip to the Ephesus area would be complete without visiting the Grand Fortress. There is an entire room dedicated to sculptures found on the sites of the Fountains of Pollio and Trajan. Full bodies, torsos, heads, and busts are all displayed, many dating back to the time before Christ. The workmanship and quality that went into these sculptures are simply amazing, and you’ll feel how old these sculptures are in your bones. You’ll be grateful and amazed. In another room, more sculptures are displayed from different locations. In this room all of the sculptures were found in the Terrace Houses, or slope houses of Ephesus, where the rich citizens were known to have lived. The sculptures from the Terrace Houses are preserved much better than the ones from the fountains, so you can really enjoy the fine stonework and detail. There are busts here of many famous Romans, like the Emperor Marcus Aurelius and Socrates. The details in the stone like the hair, beards, and folds of cloth are simply breathtaking. During the excavation of the ruins at the ancient site of Ephesus, archaeologists discovered a lot of money. Most of it is now displayed in this museum for you to enjoy. Since the city was so old, there are coins made from wood, stone, and of course metal for the more modern coins. It’s interesting to see all of the different money that found its way to one ancient city. As an important city for Christianity, Judaism, and Islam, it’s no surprise that many religious artifacts were uncovered during the excavations. At the museum you can see small cutouts of the Virgin with Jesus, the Apostles, and ancient crucifixes and other religious designs. Over the years of excavation among the ruins, archaeologists have discovered a treasure trove of ancient pottery. Jars, jugs, vases, cups, and cooking utensils have all been discovered totally intact. They are displayed here after being painstakingly restored to make sure they will be preserved for future generations. Colorful, patterned pottery and primitive crude glass items are just some of the items you’ll enjoy examining here. A large central outdoor courtyard is where the museum displays the larger items. 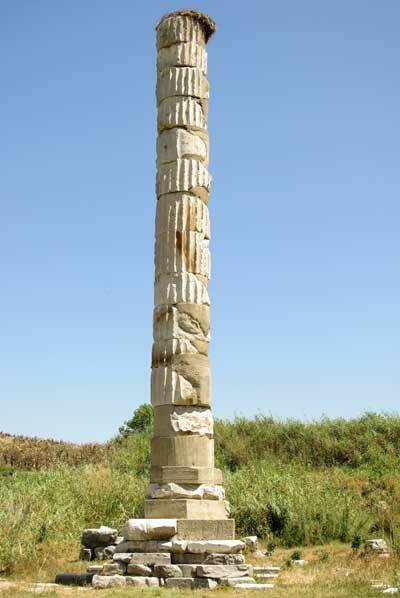 Full-size sculptures are presented complete with bases, and large sections of ancient columns are displayed on top of modern stands for your inspection. In the center is an old Roman style bath and an ancient crypt from an Ephesus graveyard. Another separate room is dedicated to a relatively forgotten part of Turkish history. This room is dedicated to Cybele, who was the mother goddess to an ancient kingdom called Phrygia. 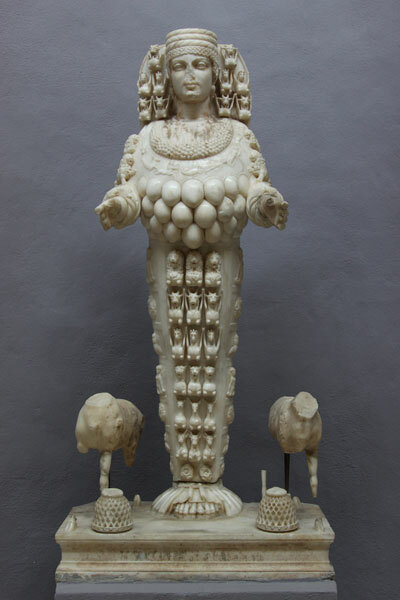 Cybele was the only goddess known to the Phrygians and displays a unique monotheistic vision with a female goddess. In this room at the museum are several beautifully crafted carvings portraying the mother goddess in all her glory. The Temple of Artemis was one of the most important structures in the Roman Empire, so it’s no surprise that archaeologists found a treasure trove of artifacts at that particular site. Many of these are jewelry made from pure gold with amazing detail and craftsmanship. Rings, earrings, pendants, and bracelets are just some of the beautiful items displayed. The Temple of Artemis was considered one of the seven wonders of the ancient world. There's little left here but you can imagine the sheer size and power of the temple just by standing in the location and looking around. Two almost fully intact statues of the goddess Artemis are displayed in this room, facing each other for dramatic effect. Artemis was the daughter of Leto and Zeus, and was the goddess of wilderness and fertility. These statues clearly reflect that, with many wild animals decorating her clothes, like lions, bulls, goats, and leopards. For fertility, Artemis has bull testicles covering her chest, which were an ancient symbol of Asian potency. Once again, the level of preservation, the craftsmanship, and the level of detail in the stonework is not to be missed. These statues are definitely priceless. Ephesus was under Roman rule for a very long time, so it’s natural that stonework glorifying Roman emperors is quite common in the area. The last room at the museum is called the Imperial Cult, and is dedicated to statues of Roman leaders. There are heads, carvings, statues, and busts of many Roman emperors, all made with exquisite ancient craftsmanship. There are also many pieces from broken sarcophagi and crypts with more beautiful carvings. Beautiful presentation and lighting really make the details stand out. With so many sites to choose from, you can probably visit a few and be done with the ruins. What you don’t want to miss is this museum. The quantity and quality of artifacts here gives you an excellent idea of the culture and history of Ephesus that you just won’t find in the ruins. 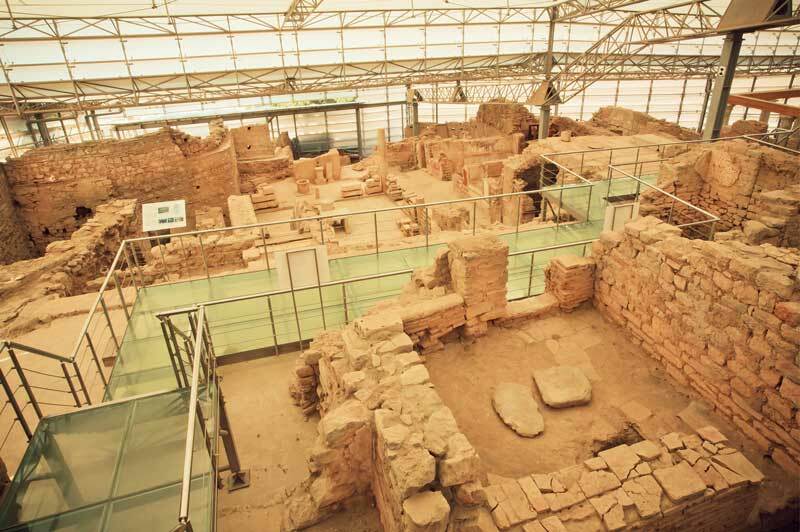 Make sure you visit the Ephesus Archaeological Museum when you’re in the area. Planning a good trip can be difficult, but one thing to consider is the weather. Ephesus is in an area that gets cold in the winter and hot in the summer, so you don’t want to explore the ruins during those times. The best months to visit Ephesus are April and May, and also October and November. 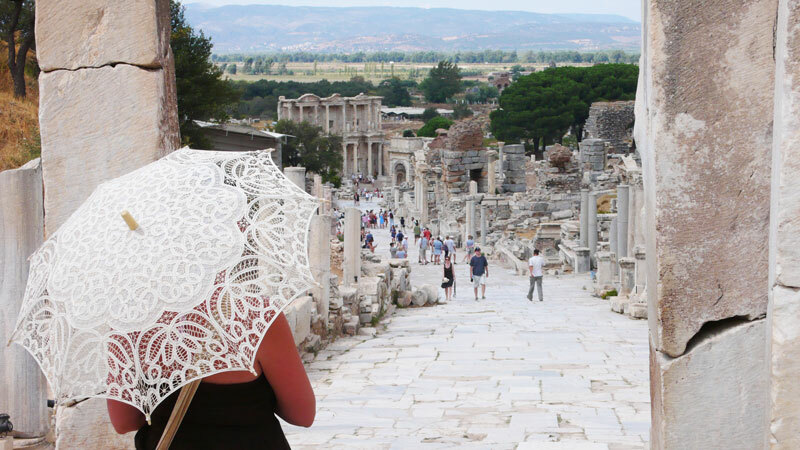 During those four months, the weather in Ephesus is neither too hot nor too cold, so you’ll be sure to enjoy your trip! In order to experience and see most of the attractions in Ephesus, most visitors stay two or three nights. If you really want to make sure to see everything, just plan on hanging around for a week so you can take your time and soak it in. With tons to see and world-class Turkish cuisine, you probably won’t be in a hurry to leave Ephesus anyway! The worst thing you can do is cut your trip short, so allow yourself plenty of time to see the things you want. Ephesus, Turkey is a truly unique place to visit on Earth and one of the best places to visit near Kusadasi. It has a long and colorful history both politically and religiously, which makes it a very important city in the history of mankind. The Christian, Jewish, and Muslim faiths all have roots in this ancient place, and many make pilgrimages to the region each year. There are many different ruin sites to visit in the area, so before you go be sure to do your research. Pick out the ones you want to see and be sure to visit the Ephesus Archaeological Museum to see all of the ancient artifacts. On your next trip to Europe or Kusadasi, make sure you schedule a nice long stop at Ephesus, Turkey. The archeological site of Ephesus is 3.4km from the centre of Selcuk. Minibuses are plentiful and take less than 5 minutes to transport you to the entrance. You shouldn't have to wait any longer than 25 minutes to get a minibus to the site. You can also use a Taxi service to bring you from anywhere in Selcuk to Ephesus. Taxi should cost around €12 to get from the centre of Kusadasi and on to the site of Ephesus, without passing through Selcuk. Buses leave Kusadasi from the Kusadasi bus station and drop passengers at Selcuk, where you can grab a Minibus/Dolmus or walk to Ephesus. It's not difficult to find a tour guide for Ephesus when you arrive in Kusadasi. In fact, you won't be able to avoid seeing advertisements for Ephesus tours. This is big business. Between one and two million people visit Ephesus every year. 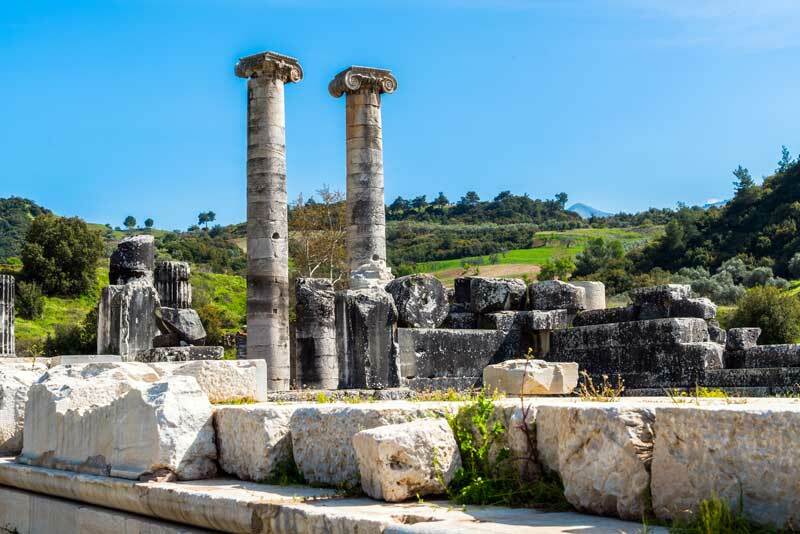 It hosts the site of one of the original Seven Wonders of the Ancient World and many people come for the allure of visiting such a high profile site, even if the Temple of Artemis is merely a pillar these days. If you haven't been to this wonderful ancient ruins and you have a free day in Kusadasi, make sure to get up early, grab your sunglasses and sun hat, and take a trip to 6,000 years of history, within an hour of the town. As with any place that attracts millions of tourists, the vast majority of whom are not locals, there are scams and rip-offs. Prices vary wildly, quality control is non-existent, and some tours actually bring you through shopping centres nearby as a way to extract more tourist dollars. 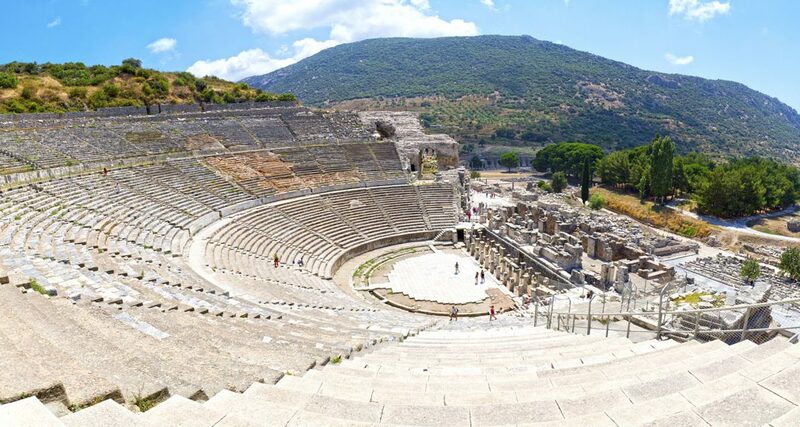 But the tours that continue to do good business are the ones that provide quality service and maintain good standing amongst the thousands of visitors to Ephesus every day. One tour group stands out for us and offers a nonsense-free, economic, and well-paced tour of this once in a lifetime tourist site. 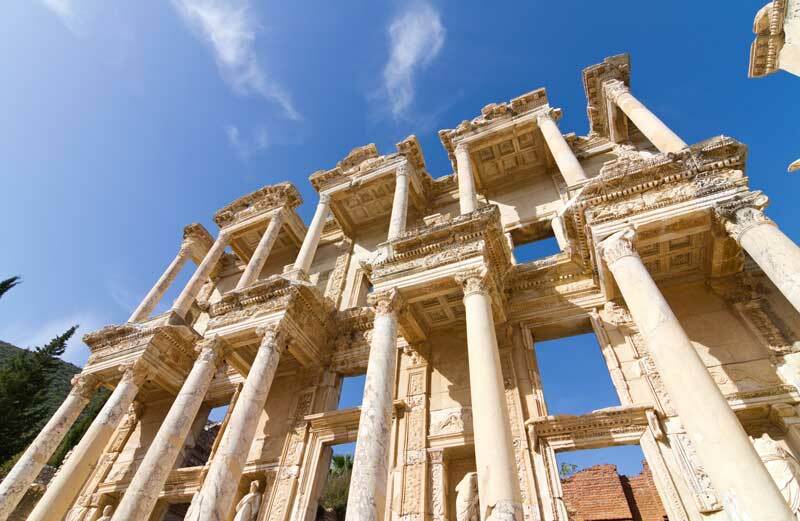 No Frills Ephesus Tours has been operating as a specialist in Ephesus Tours for 7 years now. Run by an Australian-Turkish couple, Fodor's Guide described the service as mid-range priced tours focusing on the sites while avoiding tourist-fleecing shops. It's hard not to find this recommendation alone a compelling reason to try this company. No Frills' clients range from independent travellers to cruise ship customers from all over the globe. Customers are mainly native English speakers although they also offer private tours in other languages including French, Spanish, Italian, and German. The experienced guides understand that Ephesus is often a ‘bucket list' adventure for most people so quality time and not being rushed at the sites is important. 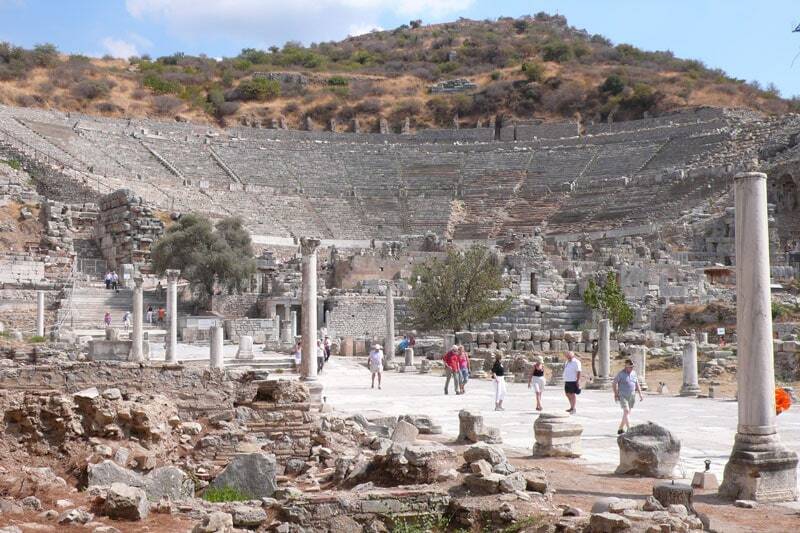 The company's customers seek us out because, according to Chris, one of the owners, the tours focus on the historical and cultural aspects of Ephesus and surrounds without the hassle of shopping stops. 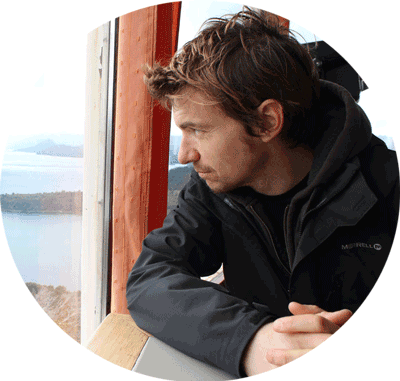 Chris also believes that removing the (very lucrative) shopping distractions enables their guides to develop a rapport with the customers as they can focus fully on their job as a tourist guide, not a salesperson. 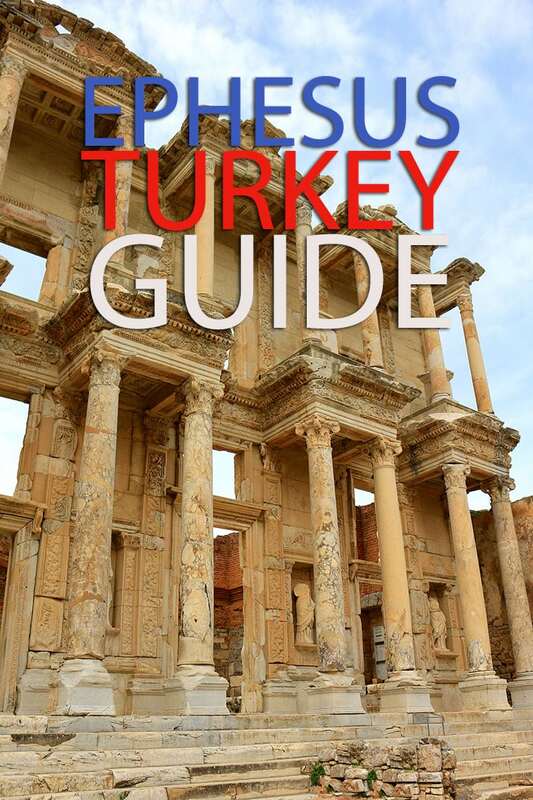 Ephesus was settled and resettled throughout history 4 times so it really does require the knowledge of a good guide who not only can tell you the history behind it but also bring the site to life with stories from ancient times. To make the most of your time at Ephesus No Frills Ephesus Tours recommend you enter the site from the ‘top gate' and exit from the ‘bottom gate' so you are walking downhill. However, on really busy days the company sometimes brings customers the opposite way to avoid the crowds. These are the tricks that only an experienced guide knows when to use. Getting to Ephesus from Kusadasi is fairly straightforward. You can hire a taxi or use a bus but No Frills offer a company HQ to Ephesus entrance transfer service as part of their tours. Full-day tours are currently running at €60 and you can also get a half-day tour. This latter option runs at €45 so it's more for cruise ship customers and people with limited time. Coming in at number 5 out of 28 on Tripadvisor's list of tours based out of Selçuk, No Frills are doing pretty well. It all comes down to word-of-mouth. Their reviews are generally glowing, and the company's name is mentioned quite a lot on forums, 99% of the time in a very positive light. If you've taken a trip with No Frills let us know in the comments below how it went! Contact No Frills via email through their website for the fastest reply.Address: St Jean Caddesi No. 3A, Selcuk, Ephesus – TURKEY. Note: We do not receive any compensation for this independent review and we have no connection with the company. Getting to Ephesus from Istanbul is quite easy thanks to the popularity of the site. Istanbul is the international gateway for tourists and many arrive in Turkey with a few places on their checklist. Ancient Greek and Roman ruins housing one of the original Seven Wonders of the World is always going to be a crowd pleaser. Several airlines fly from Istanbul and you can even visit the site as a day-trip from Turkey's biggest city. Turkish Airlines, Pegasus and Onur Air offer daily flights to Ephesus. Unfortunately, there are no direct trains making the journey but there are bus services. The trip takes at least 10 hours however so factor that into your travel plans. The bus between Istanbul and Selcuk is modern and will save you money, if not time. If you're dead set on train travel you can take a ferry across the water to Bandırma Şehir and then take a train to Selcuk. From there you can catch a local bus to the ruins. This is one of the most time-consuming ways to travel from Istanbul to Ephesus but it's also one of the most adventurous and scenic. If you're visiting Ephesus and you're based in Kusadasi or the surrounds, check out our Kusadasi to Samos day trip. Thanks that’s a good overview. Any tour company’s that aren’t rip-offs?